Read through our customer reviews and testimonials below to learn a little bit more about Roberts Contracting Inc. We have had the pleasure of working with many happy customers in the Hudson Valley. If you would like to make your own request, contact us to get started today. Robert's Contracting did a super job on our roof from start to finish and we are very pleased with the result! It was a complete tear off including the replacement of two skylights. They came to us highly recommended and we now can easily recommend them as well. Our experience with Roberts Contracting was absolutely fantastic! We recently had Roberts work on the roofs of two buildings that our company owns. We were blown away by how quickly the work was done and how professional the work was! We found Mr. Roberts himself to be a very hands on owner who stopped by to check on the status of the job and popped in to see us as well! He was very kind and attentive and we found him to be very well versed on his area of expertise. The Foreman on the Job, Elpedio, was very kind as well, always checking with us to make sure we were okay and not disturbed by any noise. Overall if I could give Roberts Contracting a 10/10 I would but unfortunately Google only lets me go as high as 5/5! Very honest and hard working company and I would definitely called Mr. Roberts if I had any other work to be done on my properties! I had several contractors quote my roof and Roberts was by far the most Professional from start to finish. Excellent work, Excellent Prices and Excellent Staff in the office. The work crew was so careful around my flowers too. Very considerate. Not one scrap of tile or nail left behind. Our roof looks AMAZING, So happy I chose GAF and Roberts! We will absolutely be back for our Siding. We have had 2 jobs completed by Roberts Contracting. Each time response to our telephone request for estimate was immediately booked and estimator arrived on time as booked. Both times the quotes for work were comparable to others. Both jobs were done with the least amount of disruption to our home and family. Both times the person in charge checked with us before unloading materials to make sure the placement was acceptable. After each day's work, the area was cleaned and extra care was taken that our pets could not escape from the yard. The worker's were prompt, courteous and respectful at all times. When something unforeseen occurred we were always shown and given options for correcting the issue and what additional cost may be. When bad weather interfered with the work, we were given a courtesy call and new date and time. Everyone from the original contact, workers and office staff have been easy to work with and were able to answer all questions. We are in process of contacting them for another job!! A well oiled machine. I hired Roberts Contractors to install a new roof. They showed up early and started removing the old roof. Next a dumpster was delivered. Shortly afterward a truck delivered the materials. They worked all day not stopping until 3 o’clock for lunch. By 5 they were cleaning up. A job well done by all. I can highly recommend them for your roofing needs. Roberts Contracting did a fantastic job on my house in Lake Katrine NY. I had a leak and gave them a call, and had a fast response. Roberts Contracting came, checked out the roof, gave me an estimate for a GAF shingle roof which was reasonable. A few days later, workers came, did the job to the specs on the estimate, leaving my property clean of all debris and my plants and shrubbery untouched. The employees were hard working and respectful, and I look forward to having them do additional work for me in the very near future. Thank you Kevin and everyone at Roberts Contracting! Kevin's crew arrived in full force and had stripped all the siding, soffit, fascia a from both our house and detached garage in 1 day. 7 days later, a beautiful transformation was completed. My wife and I are still in total awe of the expert work that was performed. We never expected our home to come out so beautiful. Kevin, top shelf! His crew, even more top shelf! ( Had to say that, they did the work....LOL) So very pleased and we give a true 100 star recommendation. Price was excellent and our property was VERY well taken care of and re-beautified with new siding, soffit, fascia, gutters, and more! Thank you Kevin! In the Spring of 2016; I hired Roberts Contracting to replace a 30 year old Anderson Window that was literally falling apart. Needless to say; I am very well pleased with the replacement window and the quality of the workmanship that was needed to install it. I most definitely would recommend Roberts Contracting for any of your roofing or replacement window needs. The crew was very professional and diligent in completing high quality work. I would recommend Kevin Roberts and his crew for all your roofing needs. Kevin replaced two Velux skylights and installed a GAF Roberts Roof. 50 Year warranty!!! I work for a well known doctor in Newburgh. Roberts Contracting. installed our Roof and it came out great, Not only did the roof come out super the entire experience was terrific. They gave us an estimate in December. Kevin followed up after the original estimator left the company. They matched another contractor's price, gave a superior warranty and put a tarp up at no extra charge. Roberts was an amazing experience. I needed a new roof in the middle of January. They came the next week and did an amazing job with no mess left behind. The people in the office were extremely nice and professional. There sales rep was amazing at explaining their products and helping me make an informed decision. I will be using them again in the future. I am so happy I hired Roberts Contracting Inc to install my new roof and gutters. I would give them six stars if I could. Our roof looks great! Working with Kevin and Chad has been a pleasure! They are informative and patient. We plan on having more work done with them. You completed the roofing and guttering of your home in late April of this year in a fast, efficient, and above all, timely manner since we’ve had the continuous rain for the last twenty days. I’m pleased to report that the work that your roofing men did staunched all leaks from the old roof and the new gutters have directed the flow of water away from the foundations of our house. Your team has accomplished this work under adverse conditions with a professional attitude, paying strict attention to my concerns. I was especially gratified by your concise explanations prior to the job, your flexibility throughout the project, and the respect your men showed for the neighborhood by their thorough clean-ups at the end of each day. I would highly recommend Roberts Contracting Inc. Thank you so much!!! The Siding and gutters look great. Thanks Again. Cindy Ranalli, the office manager at Roberts Contracting Inc, was sure to follow up with me the 2 times we have used Roberts. Many thanks to Juan for his expert roof repair. Just to let you know, we have been receiving many compliments on the new roof, siding, windows and gutters. What a blessing. You have certainly been a blessing to us here at Memorial United Methodist Church. We extend our most heartfelt gratitude for your gracious generosity in replacing the roof on the parsonage free of charge. I had my roof installed by Roberts Contracting Inc in July of 2012. The project was planned with great diligence by Cindy. Their pricing was competitive and they do have the proper roofing liability insurance. I called Roberts after my roof blew off after Sandy. They were prompt, efficient and did a wonderful job. 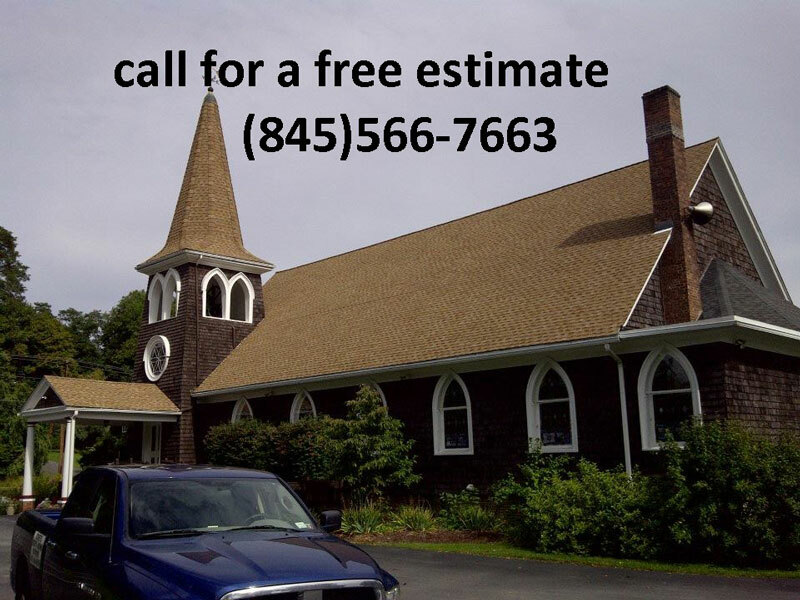 Thank for timely and cost efficient Flat roof repair at our facility in Brewster, NY. My roof was installed in Novemeber of 2011, I got 3 estimates and Roberts was the best price and most knowledgeable. My new roof looks great. Please communicate to your crew how impressed I was with the work they did while they were here. Each night they left the parking lot and grounds immaculate. All the parishioners were equally impressed. With out hesitation, I would recommend Roberts Contracting Inc to anyone. The roof looks great. Thanks for the quality work and clean up. Thank you for working with me on my roof project. Your guys worked like demons. Ann Marie and Myself appreciate you sending the crew over on a Saturday to clean up after the fire at my father in laws house in Marlboro. Once again, thanks for helping me out. Danielle and I want to personally thank you and your team for the outstanding job. Your crew was polite and courteous. When they left at the end of the day, the house was always clean. The entire job, roof, siding and windows was completed on time as you promised. Both Esther and I would like to thank you and your crew for the excellent work. The house looks beautiful and hopefully will age that way. With this check we are now paid in full for the roof, siding, gutters, doors, deck and replacement windows. Thank you for doing a great job on my roof in short notice, It looks great. Thanks for the great job installing my roof. I love the color and the crew did a great job cleaning up. By reputation, kevin Roberts is one of the top roofing contractors in my territory, in both quanity and quality of roofing installs. Kevin’s commitment to training his installers and the pledge to provide homeowners with outstanding customer service has earned him a special certified status with GAF.